Of the five starting pitchers who began the 2010 for the Bulls, four are on the disabled list — Heath Phillips, Virgil Vasquez, Carlos Hernandez, and Jeff Bennett (who ended up in Nashville in the PCL league where he is on the DL). The exception, of course, is Jeremy Hellickson. And we will mention in passing our favorite guy, Jason Cromer, who never really showed up this year. Richard De Los Santos, Ramon Ortiz, Brian Baker, Aneury Rodriguez, Bobby Livingston. 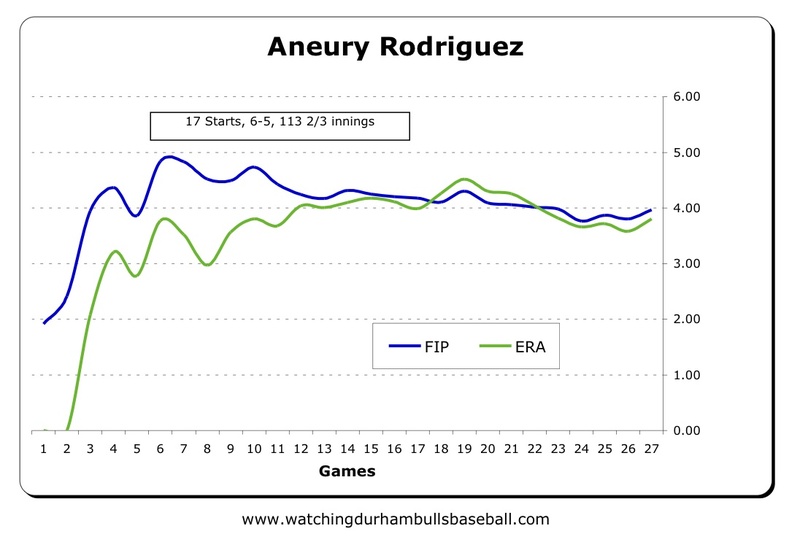 We’ve got decent numbers on three of those guys, so here are their charts. Once they get a few more innings in, I’ll put up what we’ve got on Ortiz and Livingston. 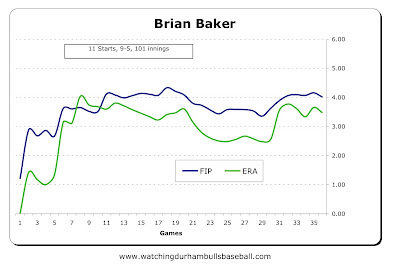 A bit of apples and oranges here in terms of how each player got to where he is statistically. 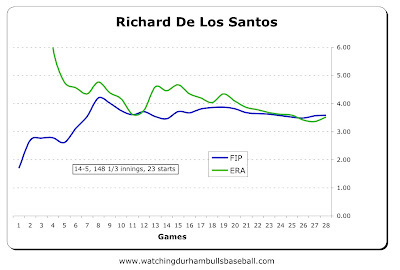 De Los Santos has, by far, the most innings and the most starts. 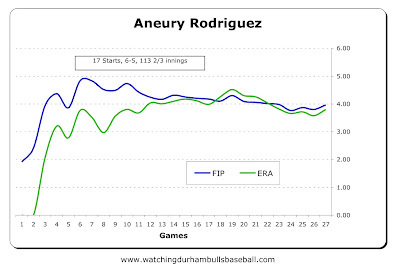 But they all have been relievers and starters this year. 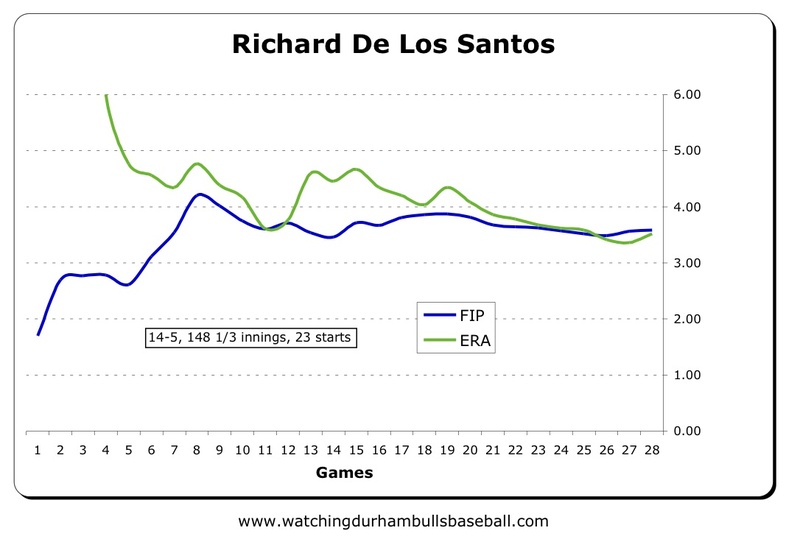 The curves show what a steady performer De Los Santos has been all year, while Baker has been much more erratic (sometimes in a good way). 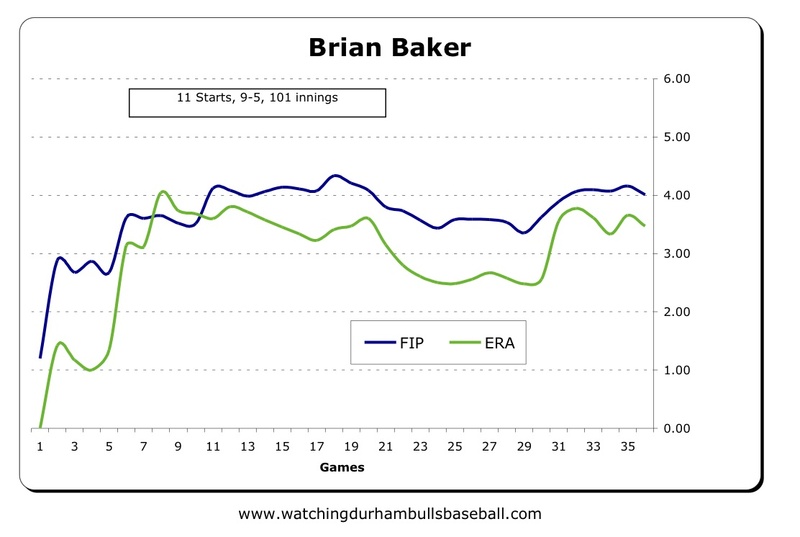 At the moment, Baker certainly appears to be on a slight improvement trend while Rodriguez is on a very slight downward trend.